Although not a disaster response organization, the Cooperative Baptist Fellowship responds when major disasters strike around the world through its own resources or through partner organizations. When gift-in-kind donations are helpful in disaster relief, the Fellowship serves as a clearinghouse, matching a donor with a need in the disaster zone. Frequently, the Fellowship establishes a designated fund, where individuals and churches can financially contribute to relief for a specific disaster. When volunteers are needed, the Fellowship invites individuals and groups to apply for various service opportunities in the disaster zone. The Cooperative Baptist Fellowship's model for response ministry is to be a long-term presence, helping communities recover and rebuild. This is most notably seen in CBF's response to the Asian tsunami in 2004 and Hurricane Katrina in 2005. In both areas, the Fellowship spent years helping individuals and communities rebuild. This year, CBF continues to work to help victims of Hurricane Harvey and Hurricane Irma. For more information about how you can organized your church to help, to to www.cbf.net. CBF Kentucky has adopted the CBF’s philosophy for Disaster Response with the primary focus on long-term recovery in overlooked and economically depressed communities. We have two primary phases of response. Phase one: After the first responders have left and the CBF Disaster Response team has completed their assessment and set up the logistics, we send teams to remove debris, clean out mud, tear out drywall, etc.. This requires putting together teams on a short notice which is often difficult for individual churches. Thus, we form statewide teams. After team leaders have been secured and the logistics worked out, an invitation will be sent state wide inviting CBF Kentuckians to join a team. If you are interested in the possibility of becoming a team leader and/or being on a notification list when teams are being formed, email Charles White at disasterresponse@cbfky.org with your name, church, phone number and email address. Phase two: In the months, even years, after a disaster folks are still trying to put their lives and homes back together. This is when we send teams to help with reconstruction. These teams are primarily church led teams with CBF Kentucky helping with the logistics. If desired, we can extend an invitation to CBF Kentuckians statewide to join your team. Of course, you can limit the number. If your church is interested in leading a team or simply looking for a meaningful project for a church mission trip, contact Charles White at disasterresponse@cbfky.org. In state disasters: In addition to sending teams, we, along with CBF Global and our VOAD partners, help coordinate the local and CBF wide response to in state disasters. VOAD (Voluntary Organizations Active in Disasters) is a nationwide coordinating body of Disaster Response organizations. 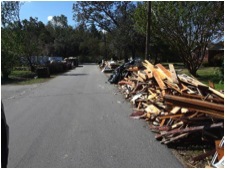 In February, five months are Hurricane Irma trounced the coast of Florida, a First Baptist Church Middletown/CBF Kentucky Disaster Response team traveled to Jackson Heights in north Jacksonville to help with the reconstruction homes. This economically depressed community had been overlooked by all the major relief organizations. In February when the Ohio River left it banks, Community Baptist Church, Henderson served as a Red Cross shelter for two weeks providing a place for the displaced to stay until they could return to their homes or find other places to live. In the aftermath of Hurricane Florence a CBFKY DR team made up of folk from various parts of the state traveled to Trenton, NC, an economically depressed town where flood waters reached record levels. It is estimated that 75% of the homes were damaged with over 50% requiring major repairs. The CBFKY team tore out drywall, insulation, floors and cabinets in two houses, Town Hall, a church and the American Legion Hall (repairing it for a staging and respite area for DR teams). YOUR FINANCIAL SUPPORT IS ALWAYS WELCOME! Many are not able to physically participate in disaster response, but all can participate with their financial support. If you would like to donate to CBF Kentucky’s Disaster Response efforts, you can do so by sending a check to CBF Kentucky, P. O. Box 7098, Louisville, KY 40257; or, by going back to our Home page and clicking Donate. Please make sure to let us know that your donation for Disaster Response. If you have any questions about this, you can contact our office at (502)426-1931.